Acting Director for U.S. Immigration and Customs Enforcement Thomas Homan takes a question from a reporter at a Department of Homeland Security news conference at the Ronald Reagan Building in Washington, Tuesday, Dec. 5, 2017. The acting director of the agency responsible for deporting immigrants plans to retire. 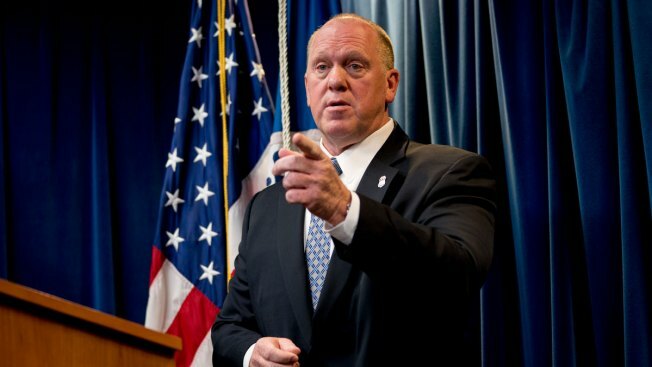 Thomas Homan, whose retirement plans were first reported by the Wall Street Journal, has served as the acting director of U.S. Immigration and Customs Enforcement since the beginning of the Trump administration. An ICE official told NBC News that Homan had planned to retire in January of 2017, at the end of the Obama administration, but stayed on until the Trump administration could find a permanent nominee. His last day of work is expected to be in June. “It has been the honor of my life to lead the men and women of ICE for more than a year. The decision to leave federal service after more than 34 years is bittersweet, but my family has sacrificed a lot in order for me to serve and it’s time for me to focus on them. I am humbled and inspired by the 20,000 American patriots who serve this agency and protect our nation, increasingly in the face of unfair and false criticism from politicians and the media.